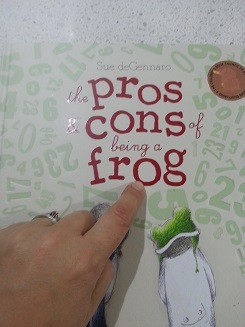 Learning activities for this week are based on the gorgeous book ‘The Pros and Cons of Being a Frog’ by Sue deGennaro. This week start your learning activities with ‘before reading’ questions. Our questions will focus on predicting what the story might be about. Before you read the book to your child, look at the front cover of the book together. Say something like, “Let’s look at the cover of the book. What can you see?”. Then ask, “What do you think this book might be about?” After that, read the title to your child, pointing to each word as you read them. 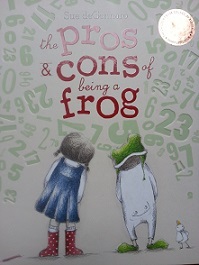 Ask, “What does ‘pros and cons’ mean?’ Now, at this point you have a choice – you can discuss the meaning of ‘pros and cons’ with your child giving examples to help their understanding. 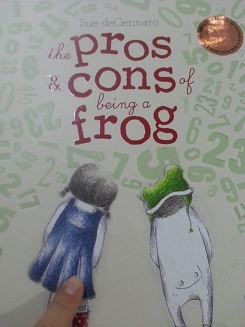 Alternatively, read the book together and see if your child can get clues from the book to explain the meaning of ‘pros and cons’. Either way, you will be exploring vocabulary. Discuss the pictures. Who might this girl be? Read the title. What might this story be about? This story seems to have all sorts of things that could be discussed from friendships to appreciating differences. You may want to read this book a couple of times – make sure you stop to look at the great illustrations. Think of a family issue or your child may have a dilemma they need help with. Write a ‘pros and cons’ list – you can write down your child’s ideas if this keeps the activity flowing better. 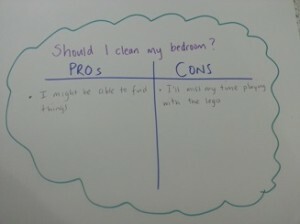 At the end of the pros and cons list, make a decision – is it a good thing or a bad thing? / will you do it or won’t you do it? Tell your child that many people use ‘pros and cons’ type lists to come to a decision for simple things, as well as major decisions. You’d have to have a dress up session with this book, wouldn’t you?! Many children love dressing up as book characters but this activity can be more than just fun. Pretending to be a character from a book can help your child see things from another persons/characters point of view, which is quite a clever thing to be able to do. Now, the character interviews. Ask your child to be a character from the book – maybe Frogboy, Camille or even Dodie the dog. Then ask your child questions to which they must answer from their chosen characters point of view. Whenever I have done character interviews, a bit of practise is necessary as well as a hairbrush for a microphone! How many groups of two? I love the idea that Camille starts singing the six times table when she is hungry! To learn the tables, children need to know what it means. 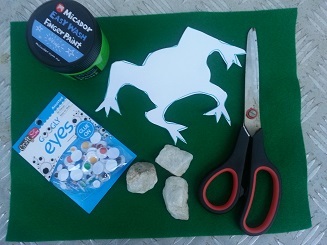 So today cut out 12 lily pads and draw, print off or use objects to represent frogs (I’d have about 8o on hand and these can be used for other activities). 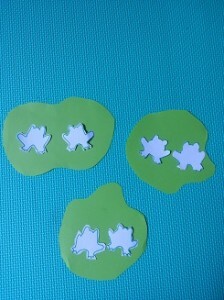 Start by placing down three lily pads- put two ‘frog’ on each lily pad. Ask your child “How many groups of two frogs are there?. Then ask ‘How many altogether?’ Continue to place down more or less lily pads and keep asking ‘how many groups of two are there?. You can then try with groups of five as well as groups of six and link this to the book. You may also show your child the ‘groups of’ sign – the multiplication symbol ‘x’. Every time I have done ‘pet rock’ type activities with the students in my class it has been a real hit. So I thought it would be a great idea to make a frog rock to represent all types of friendships. 2. Paint your rock green and let dry. 3. 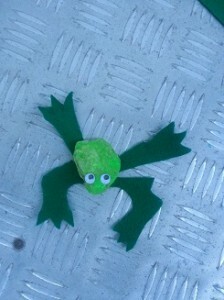 Use a frog template to create a frog body or four frog legs. As I’m not a very good drawer, I used a template off the internet. Having done a recent search, there is a good pattern on Ziggity Zoom to help you: http://www.ziggityzoom.com/activity/frog-prince-rock-buddy. Trace your template onto green card, foam or material. I decided to cut out four frog legs. 4. Once your rock is dry, glue on the googly eyes. 5. Glue the legs onto the bottom of the rock or if you cut out the whole frog body, glue the rock on top of the frog body. Now you have a new pet frog rock pal!